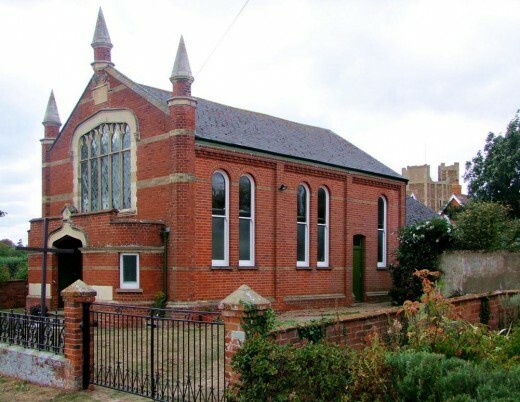 Orford Methodist Church is a more recent building than St. Bartholomew’s but has a significant presence in the village. 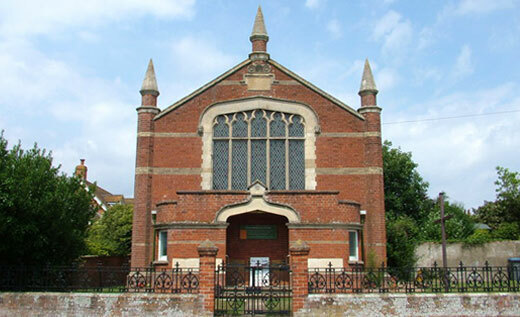 It attracts a large congregation and regularly offers less ecumenical services with teas and art shows. Orford's Methodist church is tucked away in a side road, an imposing sight with the ruined tower of the castle rising behind it. It is a perfectly Edwardian building, the foundation stone laid on the 29th October 1901. The style is very much that of Anglican and Methodist churches of the period, a large perpendicular window above an entrance portico, the red brick banded with white. The pinnacles create a deliciously independent faux-classical effect. Two corbel heads either side of the window grin and scowl in turn. All in all, this is a fun building. It replaced an earlier Primitive Methodist building of 1837. At the time of the 1851 census of religious worship, Orford Methodist Society had a membership of 18, and was served by William Dolman, the Minister at Kelsale, who had a fair journey each Sunday. The old building held just 150 people, so was probably much smaller than its 20th Century replacement. It seems to have been nearly full every Sunday.